For 9 days we had been sailing leisurely from Marmaris around the archipelagos that hugged the Turkish coast. Tomorrow we reach Bodrum where we must leave this idyllic existence. Another morning was spent in a little cove, swimming and swimming and reading and swimming and reading and swimming. Am I being a little monotonous?????? Yesterday we had anchored in the ancient city of Knidos. Ruins were scattered along 3kms of the coast. We had to pay to land – I contemplated swimming to shore.What would have happened then? Me in my swimming costume with no money but that didn’t happen. We paid our 10 dollars and explored the many ” antik” sights. There was an ampitheatre which once seated 3,000 people over 2,000 years ago. Some of the ruins that we saw were those of houses, streets, shops, water wells and sundials. We wandered around giving our renditions of what might have occured here so long ago. 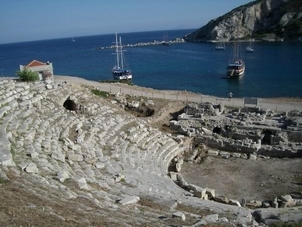 This seaport dates back to about 400BC and was founded by the Dorians. It was home to a thriving ship repair and trading business. The ship taking St Paul to Rome for trial, had to hole up here for some time. Nowadays the area is home to goatherds and olive, almond and fruit trees. In the evening, we returned to the one and only restaurant. It had promised authentic live music. A nearby “middle” school was having their graduation to “upper” shool. All the families were there. The children were about 15 years old. They sang and they danced. The parents smiled and took videos. Our table suddenly came alive as the other two occupants began playing their authentic music. One man played a 3 stringed Turkish Guitar, the other a small drum. I played the table and so too did Tim. When they had finished , I examined the instrument. They watched me as I tried to produce a chord. One said “Do you play the guitar?” My guitar teacher would have been very amused as I nodded to the affirmative. To my horror, they hurried off and brought back a guitar. I managed to produce something. When they asked me if this was my profession, I shook my head so hard I thought it would fall off. All the students began dancing so we headed back to our boat. On the way, we bumped into our young driver who had a smile wrapped around his face. Tolga was so happy! His sister was graduating and his mother was there too. Happy days. We all smiled and laughed and wished everyone well and too soon we were back on our boat. Previous Previous post: BYRON BLUES – I DON’T THINK SO!